We are the people living in the 21st Century, an era of Science and Technology, and naturally, being educated enough, we do not believe in something that is beyond a scientific explanation, or something, that even science can’t explain. But there exist some phenomenon, which are literally beyond scientific elucidation, even today! So many old rites and rituals, and even some obsolete beliefs have been rejected today, because we are able to find out the ‘reasons’ of death. Earlier, if a person would die of tuberculosis, people would mark it as a task of the evil, the blood vomits were counted as fall of the evil. But today we have found out cure, and if not cure, then diagnose, of most of the diseases, and so we abolish the mere thought of any supernatural phenomenon, occurring in today’s world. But, not all theories have explanations, and not all people are purely scientific. There exist some people, even in today’s world, who not only believe, but also indulge themselves in black magic, voodoo and santet. Black Magic: It is the use of supernatural powers for evil purposes, and destructive measures. Voodoo: It is a kind of spell casting, by inviting the spirits of dead and deceased, and sometimes, trapping the spirits of an alive individual, and make him do what you want. Santet: It is an Indonesian practise, to harm or kill people using black magic, often by inserting nails, wires, insects, into the body of the victim, causing pain and death. There are different names, and practises for black magic in today’s world. It is often done with a little or no contact with the victim at all. Sometimes, the magician demands blood, or hair or even nails of victim, and sometimes, just an object that he has touched, is enough for him to cast his spells. The black magician usually claims to be able to contact spirits, and even talk to them. Sometimes, the magician even makes a dummy doll, and casts some spells and magic, and can trap the soul of the victim in the doll. What happens next is history! We, being realistic and logic-demanding people would of course consider it to be deceptive, but what I saw in a video recently, definitely put me into thoughts, and that was when I decided to write upon this theme. 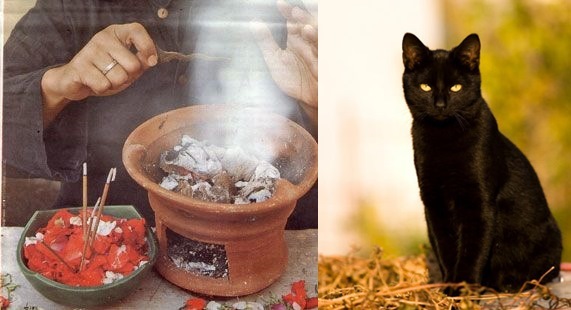 Black Magic practise is widely practised in India, even now! Kalia Massan is the most ‘dangerous’ form of Black Magic, and it is claimed to be efficient also. In Kalia Massan, the magician uses the power of disturbed and sad souls, who are suffering and wandering on earth, even after their death. Sometimes souls live as parasites on the bodies of people, and hence there are several temples and holy places where many rituals are practised, to ‘remove’ those parasitic spirits, and purify the body. In Kalia Massan, the basic theory is power of your subconscious. There are two types of minds, conscious, and sub-conscious. Conscious mind does what you order it to do, and so you remember what you did. But subconscious mind is usually not in control of the person. The dreams we see every night, the dejá-vu, that we experience sometimes, are all activities of your subconscious. If you get a very bad thought or dream, filled with hate or vengeance, and if you are unable to get it out of your mind, then the subconscious travels out and passes this energy to the so called ‘ghosts’ and ‘spirits’. You would have dreamt of some nightmares, which is nothing, but an out of body experience, as your body was asleep and at rest, while your subconscious, which has travelled into another world, while your physical body was asleep, the beings there have devoured on your negative energy. While this act has occurred without your will, you may actually do such an act of travelling to different astral planes using third eye meditation and various astral projections. The elevated soul will be accompanied by a spirit guide who will directly take soul after death to the mid higher astral plane and will continue its journey to the next level. On the other hand when a soul leaves the body which is not yet prepared to leave as in cases of accidental death, suicide, murders the soul is lost and does not know where to go, it is out of the physical realm because the body cannot accept the soul anymore and is medically termed as dead. This lost soul reaches the lowest astral plane, this is the plane that has maximum negativity, souls who have left the physical plane with extreme lust, hate or any negative emotion dwell here. At the entrance of this plane there is a river and there are some souls are waiting for the sprit guide to help them elevate from here, and those souls who carry a negative emotion stay back in this plane forever and often communicate with the people on earth who use black magic rituals to invoke them on the earth. This river is very frightening and when seen inspires misery. Even hearing an account of this river arouses fear. It is a thousand miles in width and it does not contain water. It is a river full of blood and pus with heaps of bones on its banks and mud of blood and flesh. It is impossible for a sinful disturbed soul filled with vengeance, hate or lust to cross this river as it is obstructed by hairy moss and the river is filled with huge reptiles like crocodiles and alligators crowded with hundreds of flesh-eating birds. When a lost soul comes near the river in an attempt to cross, it seethes and becomes overspread with smoke and flames like butter in a frying pan. It is also covered with dreadful throngs of insects with piercing stings and vultures and crows with metallic beaks. It also contains leeches, fishes, turtles and other flesh-eating water animals. It is said that the hungry and thirsty sinful souls drink the blood flowing in the river. The sinners who fall into it wail with pain and fright. There is no rescuer for them. The hundreds of whirlpools in the river takes the ones fallen in to the lower region. They stay for a moment in the lower region and then they rise again such a soul sits on the bank of this river filled with frustration and awaiting some means to cross this river. Such abandoned souls are then called upon to perform Kalia Massan, the most dangerous type of Black Magic. Kalia Massan ensures the death of the victim within 40 days of its application. And in most of the cases, the death is due to some disease, which occurred all of a sudden. Something which was not there before. There is always an excuse for Kalia Massan, but death is ensured. In the end, I would say, black magic is parallel to ‘science.’ Some rituals cannot be explained, not even by science. While scientists argue and label black magic as a baseless and logic-less activity, but then there are still evidences of deaths by black magic. Where along with the body of victim, some of his hair, or some blood, or some nails are found, and suspicion goes deeper. What is the truth? Either science is wrong or black magic, or both are just a pathway for existence of life. Without science we would not have been able to explore the world, while black magic helps us explore things, beyond the real world. A place we can’t even imagine, exists. Black magic opens such unexpected doors for us, to explore the world, beyond explanations, and beyond science! That was, My Take On: Black Magic! Hi, can I know address of your blog? I’d sure mention credits in my article if found true. I’m sorry, I did not copy anything from anywhere, but wrote everything myself, based upon the documentaries I watched, and research I did on my behalf at the time of penning down this article – making false claims, not cool! really scary and bold writing.goosebump in each line.Reading these types of articles @ 5 am in morning really does scare the crap out of you. Even paper moving due to wind really made me feel SCARY, REALLY SCARY. how to cure it completely?? I have faced kalia masan but survived due the holy soul of my forefather who helped me in bad time.